Dominic Cutajar, Director of the National Gallery of Malta. Although the Maltese islands are small in surface extent (total area - a mere 246 sq. km), yet their role in the history and civilization of the Mediterranean is altogether out of proportion to their size. The vicissitudes of the country's varied history have not failed to impinge on the development of its art and architecture. The earliest artistic flourish of the Maltese islands unfolded within the context of this extraordinary Temple culture (3800-2500 B.C.) - a unique cultural phenomenon that produced free-standing architectural complexes in stone, identified as temples of monumental proportions, some of which have been dated earlier than the famous pyramids at Giza in Egypt. From this prehistoric gifted culture have survived a few mural decorations in ochre, a considerable body of bas-relief and statuary in stone, as well as a large collection of decorated and hand-made ceramic works of the highest quality. In particular the stone statuary - always conceived in rotund volumetric terms - presents us with the first significant collection of European sculpture. Taken together with their outstanding architecture, all these works between them form one of the most ancient and extraordinary achievements of European art. With the islands' colonization by the sea-faring Phoenician traders, Malta's history began to be supplemented by the availability of written records. The Carthaginian connection which followed, was interrupted in 217 B.C. when the Romand conquered the islands in the course of the Second Punic War. During all these long centuries Malta shared all the social amenities and the economic development typical of these two great civilizations. A parallel communance of classical ideas and artistic taste is attested by a series of luxurious temples and town-residences - as the Roman Villa outside Mdina, Malta's old capital - as well as by numerous country-villas scattered throughout the island, all equipped with baths and adorned with fine mosaic-floors, marble colonnades and classical statuaries. The classical period mellowed imperceptibly into that of Byzantium which continued without a break to 870 A.D. Christianity was introduced among the inhabitants who made assiduous use of the catacombs for the burial of their dead. In some of these catacombs have been preserved paintings and carvings inspired by Early Christian art which indicate that culturally the islanders felt emotionally closer to eastern or Byzantine Christianity. This community with	its institutions and traditions, was destroyed when a Muslim force from Tunisia landed in Malta in 869 A.D., returning in 870 A.D. to put down an attempted revolt. The Maltese islands appear to have remained derelict up to 1040 A.D. when the old city was refounded by a colony of Muslims from Sicily. But shortly afterwards the Normans ousted the Muslim rulers of Sicily and Roger I landed a Norman force in Malta in 1090 A.D. His son Roger II established a Christian commune in 1127 A.D.
With the Norman conquest of Malta began a new phase in the history of Malta. Right up to the beginning of the 16th century, Malta was to form - both politically and culturally - an integral extension of the Sicilian realm so that even the art of the Medieval Malta can best be understood within the Sicilian context. A few fresco panels, of possible 12th century origin, painted in underground crypts, have survived to our times and indicate a lingering Byzentinesque tradition infiltrated by Romanesque ideas of a popular character. From that point the story of Maltese art can be followed as an uninterrupted artistic tradition over seven centuries of continuous development. The influence of Southern Gothic can be traced in a 15th century cycle of fresco-paintings in the Medieval crypt of St Agatha; while towards the end of the same century close ties with the School of Antonello da Messina multiplied. So that by the early 16th century a number of renaissance ideas were already known in Malta, while a school of local popular artists practised an art that blended Gothic and Renaissance notions echoing similar developments in both Sicily and South Italy. In 1530 the Maltese islands passed into the hands of the Knights Hospitallers Of St John of Jerusalem whose rule was to last until 1798. The arrival of this old chivalric Order, whose members hailed from all European countries of the Latin West. Marked a new infusion of wider European influences, particularly' Italian and Flemish with a predominance of Mannerist art. Mannerist canons were apparently introduced to the Maltese by Matteo Perez d'Aleccio (d.1616), a follower of the later Michaelangelo, who was commissioned to carry out works in the Grand Masters' palace and in the conventual church of St John between 1575 and 1580. A more accomplished Mannerist artist, active in Malta from 1590 to 1595 was Filippo Paladini (c.1544-1615), follower of Pontormo who lent his works a beautiful sense of monumentality, practising a most refine version of Mannerism as befits his Florentine background. In fact Mannerism came to form the basis of the art of local painters, a pervasive influence that died hard. For 15 months running from July 1607 to October 1608 Caravaggio is known to have stayed in Malta, in the course of which he created "Knight of Obedience". During his Maltese stay, he is known to have painted at least seven works, two of which - amongst his finest - are still to be found in Malta. For a time the influence of this Lombard master on Maltese art proved to be considerable although short-lived and marginally experienced. Among his local followers, Giulio Cassarino (1582-1637) proved to be the most notable, while the career of the younger Stefano Erardi (1630-1716) evinces the continued dominance of Mannerist ideas subsequently softened by Baroque aesthetic notions. The solid impact of Baroque Art made itself felt during the 1660s, that is, following the decision of Mattia Preti (1613_1699) to settle for good in Malta where he lived from 1661 until his death. Preti transported into the still resistant enclosed island-environment of Malta his virtuosistic brand of baroque art and in so doing transformed the artistic notions of the Maltese. Baroque and the more advanced versions of it dominated the Maltese artistic scene till practically the end of the 18th century, and its influence continued to haunt Maltese art well beyond the 18th century, especially in the realm of Maltese architecture. The 17the century also witnessed a sudden jump in quality in the field of sculpture with the art of the strikingly talented Maltese Melchior Gafa (1639-1667) who, after a period of apprenticeship with Ercole Ferrata, established his studio in Rome, becoming in the course of his brief career one of the top Baroque sculptors of the Roman School. In the course of the following 18th century, Neapolitan influence permeated the artistic activity of the Maltese islands - particularly important being the influence of Luca Giordano (1632-1705) and Solimena (1657-1747). A notable Rococo efflorescence took place with such Maltese protagonists as the painters Gio.Nicola Bubagiar (1698-1752) and the more gifted Francesco Zahra (1710-1773), apart from the intensive activity of the French painter of the Grand Manner, Antoine de Favray (1716-1798) who settled in Malta in 1744, becoming in effect the court-painter to the princely Portuguese Grand Master Pinto (d.1773). The times were relatively peaceful and prosperous so that the Maltese efflorescence of Rococo Art had its basis in the social environment of 18th century Malta. In the course of the last decades of the 18th century, the Roman brand of Neo-classicism won the allegiance of Maltese artists, most of whom received their training at the prestigious Accademia di San Luca established in Rome. Meanwhile the Knights of St John had been expelled from Malta by General Bonaparte in 1798; shortly afterwards the Maltese rebelled against French rule in circumstances which soon enabled the British to install themselves in the island and eventually to turn it into their major naval base in the Mediterranean. The British colonial rulers on the whole patronised and sought to advance Neo-classicism, but the trend was soon reversed due to Church influence, which from the second decade of the 19th century preferred to foster the art of the Nazarener brotherhood established in Rome by a band of German converts to Catholicism. The hazareners had attempted to revive the Medieval concept of a guild of artists, creating in effect a religious brotherhood (later imitated by the Pre-Raphaelites), thus giving their art a net religious character. Their cause in Malta found particularly fertile ground in the enclosed and religion-dominated environment of 19th century Malta. Staunchly championed by Giuseppe Hyzler (1787-1858), the Hazareners followers in Malta dominated the arts for most of the 19th century. During the 19th century, Maltese art entered upon a period of sad decline with the best achievement realised in the field of topographic art dominated by the Schranz artists, a foreign-born dynasty of painters. The best of the Maltese artists often preferred to settle abroad, many of them seeking to make a career in the impoverished but exotic provinces of the decaying Ottoman Empire. Among these enterprising artists, the most gifted proved to be Amedeo Preziosi (1816-1882) who passed most of his active life either in Costantinople or roaming all over the Balkans.,particularly in Wallachia. In Malta itself the introverted academicism fermented by the Nazareners prevailed, mitigated solely by half-hearted attempts to create a fresher Romantic sensibility; particularly valiant were the efforts of Naples-trained Giuseppe Cali (1847-1930) who tried hard to infuse into Maltese art the spirit of naturalism that animated so much of European art of the latter half of the 19th century. Cali's failure to make Neapolitan realism prevail condemned Maltese art to wallow in debased forms of Romanticism, his followers, particularly the brothers Edward (1876-1950) and Robert (1881-1940) Caruana Dingli provided instead a kind of fashionable, though competent Salon art. This stagnant atmosphere began to dissolve slowly during the 1920s when substantial changes were registered after the Maltese wrested from the British colonial administrators a form of local autonomy. Among the significant measures carried out by the Maltese-elected parliament was the establishment of a School of Art that began to provide a professional training to one generation after another of Maltese artists, although this progress was severely arrested by the ruinous War of 1940-1945. A clear modern sensibility throbs in the work of such artists as Josef Kalleya (1898-1998), George Preca (1909-1984), Anton Inglott (1915-1945), Emvin Cremona (1919-1986), Frank Portelli (b.1922), Antoine Camilleri (b.1922) and Esprit Barthet (b.1919). In fact the Post-War years in Malta were marked by a truly modern renaissance of the arts. A group of forward-looking artists came together forming an influential pressure group known as the Modern Art Group. Together they forced the Maltese public to take seriously modern aesthetics and succeeded in playing a leading role in the renewal of Maltese art. Most of Malta's modern artists have in fact studied in Art institutions in England, or on the continent, leading to the explosive development of a wide spectrum of views and to a diversity of artistic expression that has remained characteristic of contemporary Maltese art. While the general bias remains in favour of figurative art - typical of our Mediterranean tradition - non-representational art ever since the 1060s has continued to affirm itself as one of the most novel and explorative fields of contemporary Maltese sensibility. It generally reflects the dichotomy between the wild sensations that characterize the continental Art Informel, and the visual spectacularity moderated by rational lucidity attained by its Anglo-Saxon counterpart. In this field, there can be no doubt that Alfred Chircop (b.1933) has become the most important Maltese pioneer, and it is in fact significant that the artist's earlier formal training outside Malta - where he had studied in the local School of Art - was obtained in the U.K. at Bath Academy of Art (1960-1961). The balance and sense of rational order, so much a feature of British non-figurative art - seem to have found a natural correspondence with the young artist's own temperament and congeniality - a passion for order, at first clearly expressed as a lucid arrangement of forms The young Chircop then proceeded to the Accademia d'Arte in Rome (1961-1964) where he graduated and where he gained the first valuable experience in presenting his work in public exhibitions. 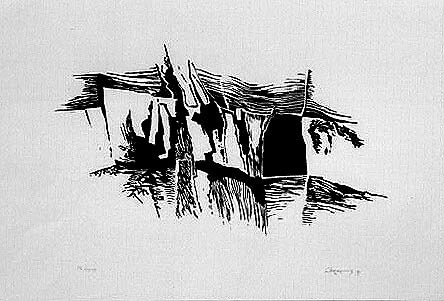 Since then Chircop's artistic evolution has been so orderly and linear that one might be tempted to consider it predictable: - a gradual intensification of complex chromaticism, a growing mastery in the exploration of space, particularly depth, and above everything else a progressive rarification of emotions. One may well say that the enrichment of his technical prowess, the harmonious fusion of form and colour, has moved forward during all these years pari passu with the enrichment of his inner vision. In the course of this process, his ability to orchestrate schemes of complex chromatic counterpoint has coincided with the refinement of a rarified lyricism, a kind of crystallised musical vision recalling the overall harmony of dissonances achieved by Gustav Holtz in "The Planets". The parallelism is by no means far-fetched; for Alfred Chircop's inner vision is a microcosm reflecting and echoing the astounding imagery we associate with the macro-cosmos and its cascades of diluted chromaticism - music from distant galaxies, suggestive of a creative fermentation in action ruled by the iron grip of the natural order. This wonderful sense of order he may well owe to nature, but the lyrical ferment of his chromaticism evinces a strong transcendental experience, the sult of an inner struggle resolving itself in an act of self-liberation. To the present writer's mind Alfred Chircop's catharsis is tied to the cosmic transcendentalism popularised in Catholic intellectual circles by Teilhard de Chardin. The correspondence of the intangible with the material is at the core of the latter's thinking, thus injecting the great idealistic message of Hope to the cosmic phenomenon of chaos and ultimate dissolution. In this narrower sense too, Malta could have found no better artist than Alfred Chircop to represent the country's art in the Hope and Optimism Portfolio. His contribution highlights dramatically, but also effectively and in the simplest of form, the eternal dialectic between light and darkness. In the expressive lattice that Chircop creates, the white zoning is neither reductive nor merely neutral. It is essentially functional - a brilliant whiteness that gleams attractively, shining out the big message of hope.